When working in a job that involves heavy lifting and the danger of falling objects, safety footwear is vital. Whether you’re a construction worker, a welder, or even a retail employee handling heavy pallets of product, you need to wear properly supportive and protective boots. There are a variety of injuries caused by slips, falls, and other common workplace hazards. Having the right boot for your job goes a long way in both increasing your comfort level and keeping you safe and healthy. While many workers need a good pair of steel toe boots, they are not required for every job. We’ve selected some of our favorite pairs from the list above to give you more details on why we like them so much. 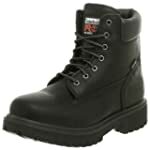 Each model you’ll see listed below is a good men’s steel toe works boots option for workers like you. The Timberland Pro Men’s Pitboss provides arch support that reduces foot fatigue after a hard day’s work. With a long-lasting comfortable fit and durable steel toe, the leather boots ensure day long comfort. The Pitboss comes in a variety of colors, each with an anti-microbial moisture wicking insole, padded collar and slip resistant outsole. 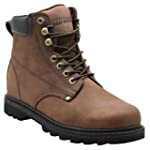 If you’re looking for the best men’s work boots for flat feet, then definitely consider these because the arch support will help keep your feet comfy, especially if you also have plantar fasciitis. The Steel Toe Raider Boot from Wolverine offers both protection and comfort. It features the MultiShox individual comfort system that combines a gel heel pad to absorb shock with a Comfort Flex Arch for support and individual compression pads under the sole to offer superior stress distribution. The bottom of the Multishox slip-resistant rubber lug tread protects the wearer from oil, water, abrasion, chemicals and heat. The boot’s body is made of genuine full-grain leather, allowing the fibers to retain their maximum strength for extreme durability over other boots made of treated leather. Wolverine’s unique Contour Welt construction allows for both greater flexibility and the ability to resist repeated bending in work environments. The steel toe offers the wearer the maximum hazard protection rating of ANSI 75. Appropriate for strenuous conditions, the Wolverine Brand Steel Toe Raider boot contains wave mesh lining that increases breathability without sacrificing strength or durability. The Caterpillar Men’s Second Shift Steel Toe Work Boot has genuine leather uppers, a padded collar and tongue for additional comfort and support, and oil resistant rubber with large tread soles for better traction. The 6-inch leather shaft features both hexagon grommets on the lower end and hooks on the collar for faster lacing. The rounded steel toe allows for a more roomy fit while protecting the foot from heavy objects. The boots come in two colors: dark brown and honey. They also come in a large range of sizes and widths. One thing to keep in mind is that they are not the best option for concrete because you may end up needing new insoles after only a couple months wear, but overall these are good, comfortable and sturdy work boots. The Irish Setter men’s 6-inch steel-toed work boot delivers comfort and safety for your feet at work, at home and on the hiking trail. Designed with all-day comfort in mind, these boots feature a cushioned insole and a padded tongue and collar. Stay steady on your feet, even in wet conditions, with the slip-resistant PU V-Grip outsole. Made from synthetic materials, the sole meets ASTM standards for situations involving electrical hazards, keeping you grounded and safe. Durable leather construction helps these boots to mold to your feet for a customized, comfortable fit. Bolstered by D-rings, the lace-up front is built to withstand heavy use. The incorporated steel toe protects your feet from impact with heavy objects. The KEEN Utility Men’s Milwaukee 6″ Steel Toe Work Boot has a slip resistant rubber sole to prevent electrical accidents. It is 6″ tall and comes in a two-tone color of brown and black. The KEEN men’s boot is designed for work. They flex easily at the back of the ankle and at the toe for stooping and kneeling. The KEEN Utility Men’s Milwaukee 6″ Steel Toe Boot has solid foot protection with a steel toe and extra layering over the roomy toe area. This style is not waterproof. 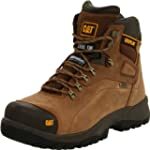 This boot is dependable in construction, carpentry, outdoor activities, and in many other hard working job environments. If you’re not sure what type of boot to buy, ask. Start with your HR manager or site overseer, then speak to your peers. Remember that what works for them might not work for you, but take their advice and ask about the conditions you’re most likely to work in. This will help you decide what sort of construction and style is best for you. Remember, there are a ton of different features to your boots, both in terms of safety and comfort, from antimicrobial insoles to extra-padded work boots. Try on several pairs, and make sure what you’re buying is right for you. There are a variety of different types of safety boots on the market, made from different materials. The first thing you need to do is figure out what kind of boot you’re looking for, and what would work best for the job you’re doing. For instance, did you know that steel toe boots are not the only type of protective toe covering? Though they’re the most common, they can also be a poor choice for environments that have variable temperatures, such as high heat or high cold, due to the steel conducting the temperature to your foot. In addition to steel toes, you can also find aluminum- and composite-toed boots. Both of these have their pros and cons. Both still meet ANSI/ASTM safety guides, but both are thicker than steel toed models. Aluminum is the most lightweight, and therefore allows for a lighter boot and freer movement. Composite toes are lighter than steel, but the thickest option, so your boots will look bulkier. However, composite toes don’t conduct heat, due to being made of carbon fiber, plastic, or Kevlar, so if you’re working in an environment with high or low temperatures, composite toes may be the best choice for you. Then there is the choice between lace up and pull on boots. You also have the option of work boots with metatarsal guards, which provide an extra layer of protection over the top of the foot. These guards are highly useful in environments like welding shops, where hot materials may be a concern, or if you’re working on a construction site with a lot of heavy materials. Another important factor to consider is the sole of your boot — you want to think about both the materials it’s made of and the way it’s attached to your boot. You’ll typically have the option of either a rubber or TPU outsole. Rubber outsoles are the most common, and are slip- and abrasion-resistant. However, TPU outsoles are abrasion, oil, and chemical-resistant, and are also more lightweight than rubber outsoles. Depending on the type of work you’re doing, a lighter-weight boot may be more beneficial to you than one with a traditional rubber outsole. You also have to consider how your sole is attached to the rest of your boot. Your boot may be cheaper with a cemented sole, where the sole is “cemented” directly to the rest of your boot; this results in a boot which is lighter in weight and more flexible, but your sole cannot be replaced in this construction. There’s also the welted construction, most commonly the Goodyear welt, where the upper and inner sole are stitched together and then stitched to the boot through the “welt,” or leather strip. These have slightly less flexibility, and are slightly more expensive, but the sole can then be replaced when it wears out. One of your most important considerations is whether or not your work boots fit properly. If they’re too tight, you run the risk of rubbing your feet raw, getting blisters or corns, or doing other damage; too loose, and you increase the risk of injury. When shopping for a new pair of work boots, you want to make sure you’re wearing the sorts of socks you would normally wear on the job. You also want to shop for your boots in the afternoon or evening. Your feet may be slightly swollen from the day, and if you fit your shoes to your feet at that time, you’re much more likely to be comfortable throughout even the longest and toughest work sessions. Don’t buy your boots tight, expecting them to “stretch out”; work boots don’t tend to expand, so if they’re tight when you buy them, they’ll stay tight and uncomfortable and impact your job performance. It’s also important to properly care for your boots when you’re not working. Store them in a cool, dry place that will let them dry out — this will help preserve the leather. You can also use mink oil or other leather treatments to keep your boots from cracking and make sure they’re resistant to water. The better care you take of your footwear, the longer you’ll be able to wear them for, so treat your boots right.